Kompali. Photo from Kompali Facebook page. A year after the closure of Cempazuchi, the space now has officially re-opened as a new restaurant. 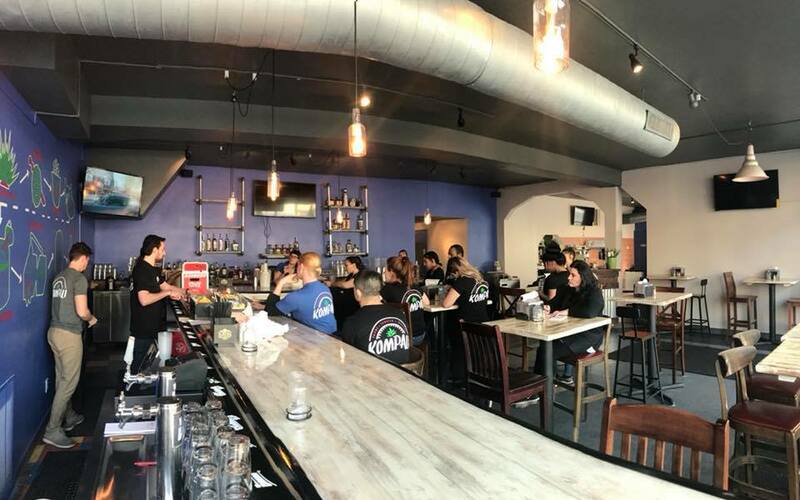 Kompali (1205 E. Brady St.) opened on Monday, bringing a “modern taqueria” to the neighborhood. Owners Karlos Soriano and Paco Villar also operate C-Viche (2165 S. Kinnickinnic Ave) in Bay View, which specializes in family recipes. There are tortas, including the Milanesa featuring breaded chicken or beef served on a traditional bolillo roll with panela cheese, tomatoes, onions, mayo and jalapenos ($7.50); the jamon with ham, Oaxaca cheese, onions, tomato and avocado ($6.50) and carnitas featuring braised pork, pickled red onions and jalapenos ($8.50). As for tacos, you’ll find two sections on the menu. “Paco’s Tacos” feature more traditional options served on corn tortillas that are made in-house daily. Options include carnitas featuring pork shoulder, cilantro and onions ($3.50), housemade chorizo with queso fresco, cilantro and onions ($3), beef barbacoa made with brisket and pickled red onion ($4), the de alambre with grilled beef, ham, chopped bacon, onions and green peppers ($3) and tinga featuring grilled marinated chicken with onions and cilantro ($2). Meanwhile, al pastor tacos are made with seasoned pork that’s been roasted on the traditional trompo with pineapple. It’s served with additional pineapple, onions and cilantro ($3). The vegetarian papa con rajas features potatoes, chilis, cotija cheese, onion and cilantro ($1.50). The drinks menu is heavy on fruit-flavored margaritas and mezcal cocktails. Kompali is open 11 a.m. to 10 p.m. Monday through Thursday, 11 a.m. to 11 p.m. Friday and Saturday, and 10 a.m. to 8 p.m. on Sunday. The bar will be open later on Friday and Saturday, and Sunday morning brunch will be offered in the coming weeks. Silver City will turn into a pho city during the month of February. “Phobruary,” the annual celebration of the Vietnamese noodle soup dish, will return for its fifth year this February. Phobruary will be held on W. National Ave between Miller Park and the Mitchell Park Domes. Bowls of pho will be available Monday through Friday for $5 each (dine-in only). The participating restaurants are Bamboo (3427 W. National Ave.), Thai Bar-B-Que (3417 W. National Ave.) and Vientiane Noodle Shop (3422 W. National Ave.). Diners who eat at all three Phobruary restaurants in February will receive a signed certificate of achievement and be entered to win a $25 gift certificate to Asian International Market, 3401 W. National Ave. To enter, diners must submit receipts and photos of themselves with each bowl of pho to celia@lbwn.org. And the first 10 people to eat at all three Phobruary spots in one day will receive a $25 gift certificate to Asian International Market and a signed certificate of excellence; send receipts and photos to celia@lbwn.org. Bamboo is open Thursday through Tuesday 10:30 a.m. to 9 p.m. Thai Bar-B-Que is open Wednesday through Monday 11 a.m. to 10 p.m. Vientiane Noodle Shop is open 10:30 a.m. to 8:30 p.m. daily. Dear friends and customers. I would like to announce that I will be working to rebrand my company effective immediately. It has come to my attention that the name around which I have created a brand is offensive to the people from which it stems. While not my intent, the name I chose to represent me as a chef was founded upon an inaccurate definition that disregarded the long history and plight of the Romani people. The local community has spoken and I have made it my mission to listen. I apologize to those I have offended. It was not my intent…I ask only that all affected respect the time and capital necessary in the rebranding of a business. The process cannot be done overnight, but rest easy knowing it begins now with this. Ciohon also noted that while he didn’t understand the offensive nature of the word at first, he now does after doing significant research. The Romani people have been persecuted throughout history, and were targeted by Nazis during the Holocaust. Paul Bocuse, the “French culinary giant,” passed away on Jan. 20 at the age of 91. Buckley’s Restaurant (801 N. Cass St.) will honor the chef by serving dishes inspired by Bocuse’s recipes on Friday and Saturday. Scallop of duck foie gras ($18), pan-roasted duck liver, passion fruit sauce, potato gaufrette and brioche, available both days. Sea bass in puff pastry ($30) with choron sauce, haricot verts and onions (Friday only). Fricassee truffled chicken ($33) with sauce supreme, turned vegetables, black truffles, wood ear mushrooms and fingerling potatoes ($33). Bocuse founded the Bocuse d’Or, an elite cooking competition for international chefs. Bocuse’s restaurant near Lyon, France has earned three Michelin stars. Sharp objects and alcohol sound like a good combination…don’t they? Well, Marla and David Poytinger, owners of Splash Studio and Nine Below, think so. The two plan to open AXE MKE, an ax throwing bar, at 1924 E. Kenilworth Pl. AXE MKE will feature several throwing cages – or “pits” – as well as a full bar and private event space in the 4,000-plus-square foot space, located between Yokohama and Ma Fischer’s.